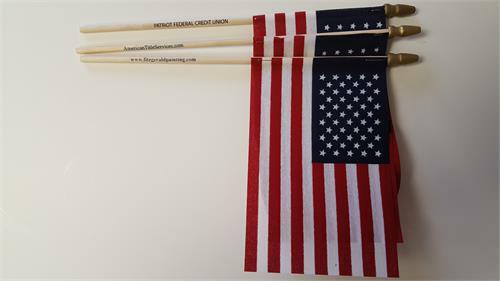 US Stick Flags are used for special days remembering our veterans and military personnel. Show your American pride and buy plenty of American flags! We have the largest inventory of American hand flags and stick flags. You can hand them out at all the parades and make sure everyone in your group can wave a flag or place one on a grave site. US Hand Held Stick Flag 4 in x 6 in - No Hem. MADE IN THE USA. Price per gross = 144 flags Click on More info for additional qty discounts. Endura Gloss US mounted flag, click more info for disounts. Base sold separately. 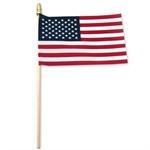 12" x 18" U.S. Endura Gloss Miniature Flag mounted on balck wood staff gold spear, base sold separately. 6 hole base, for complete set of military flags and us flag 4 x6 inch size.